A late bloomer in the chess world, David Anton Guijarro has rapidly made his way to the top. Compared to his peers who all made Grandmaster at a young age, Guijarro didn’t become one until he was around 18 years old. That hasn’t stopped him from marching his way to be included among the chess elite though. He has recently peaked at a best rating of 2642. He is also the third best player in all of Spain! With his target to be at the top of the chess world, Guijarro is aiming high, but he definitely has the strength to achieve his goal. David Anton Guijarro had a later than normal start among his peers. He crossed the 2000 rating barrier when he was 13 but quickly gained strength and drew recognition. He became a FIDE Master in 2009 and an International Master in 2012. His most notable tournament successes have all come within the past few years. This includes the 2012 U-16 European Championship where he won the bronze medal as well as the 2013 U-18 World Championship where he won silver. 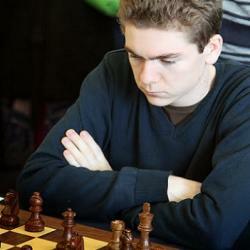 Guijarro earned the Grandmaster title in 2013 and followed that up with even more tournament successes. In the 2013 Spanish Championship Guijarro tied for second place and also had a great performance in the 2014 European Individual Championship where he again tied for second place and earned a silver medal. He has also won the Spanish Championship 8 times in differing age sections throughout his career. He is currently the second ranked player in Spain as well as the eighth best junior player in the world. His rating has recently hit it’s best, 2631, and his goal to increase it even more and become an even stronger player.